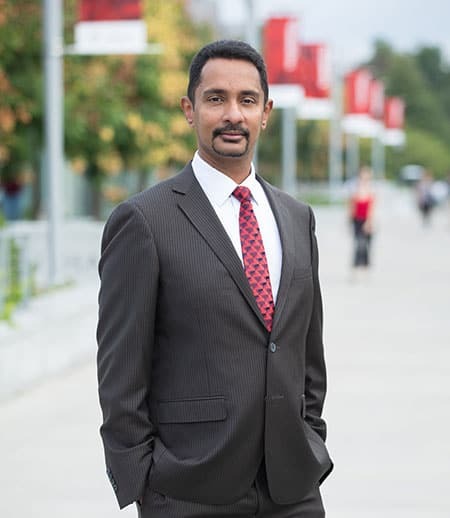 Ray Jayawardhana joined Cornell University in September 2018 as the Harold Tanner Dean of Arts and Sciences and professor of astronomy. A graduate of Yale and Harvard, he uses many of the world’s largest telescopes to explore planetary origins and diversity. Jayawardhana is co-author of more than 125 papers in scientific journals. He is also a writer whose articles have appeared in publications including The Economist, The New York Times, The Wall Street Journal, The Atlantic and Scientific American. His research and writing have led to numerous accolades, including a Guggenheim fellowship, a Radcliffe fellowship from Harvard and the Rutherford Medal in Physics from the Royal Society of Canada. His book “Strange New Worlds” was the basis for “The Planet Hunters” television documentary on the Canadian Broadcasting Corp.; his book “Neutrino Hunters” won the Canadian Science Writers Association’s Book Award. He served as the Dean of Science at York University, following 10 years on the faculty at the University of Toronto. Prior to that, he held a faculty position at the University of Michigan and a Miller Research Fellowship at the University of California, Berkeley. He earned a Ph.D. degree in astronomy from Harvard University and a Bachelor of Science degree in astronomy and physics from Yale University. An avid traveler, he has visited more than 55 countries and all seven continents. His travels, for research and writing, have included numerous visits to mountaintop observatories in Chile and Hawaii, a meteorite collecting expedition in Antarctica, a parabolic flight with the European Agency, a solar eclipse chase in western Mongolia and a descent into a South African mine with geobiologists. Andrew Bass is a professor in the Department of Neurobiology and Behavior. As Senior Associate Dean in the College of Arts & Sciences, Bass oversees the physical and life sciences and mathematics disciplines, several interdisciplinary programs and the Diversity Council; serves as liaison to the university’s inter-college labs and science centers; and provides oversight for research funding in the College. A behavioral and evolutionary neuroscientist, Bass’ research strives to explain how variation in vertebrate brain organization leads to different behavioral phenotypes both within and between species. Informed by studies of animals behaving in their native habitats, his research uses fishes as model systems to explain how animals generate acoustic communication signals and how the auditory system comes to be tuned to those signals. Rachel Bean is a Professor in the Department of Astronomy. As Senior Associate Dean for Undergraduate Education for the College of Arts & Sciences, Bean oversees the undergraduate student services spanning admissions, advising and career development. She also provides oversight of the College’s undergraduate curriculum and serves as liaison to the university on the College’s undergraduate program. Bean’s research is in the field of cosmology, the study of how the universe began and evolved into what we see today. Her work focuses on extracting information about cosmological theories, of dark energy, the properties of gravity on cosmic scales and primordial inflation, using astrophysical observations of the cosmic microwave background (CMB) and large scale structure data (galaxies and clusters of galaxies). Melissa Ferguson is a Professor in the Department of Psychology. As Senior Associate Dean in the College of Arts & Sciences, Ferguson oversees the social science disciplines and a number of interdisciplinary programs. She also serves as liaison to the university on the College’s international programs and provides oversight of graduate education. An experimental social psychologist, Ferguson’s research focuses on the implicit cognitive processes that enable evaluation, goal-pursuit, self-control, and social behavior. Her work examines how people generate spontaneous and rapid interpretations of their social world, with a special focus on how people form and then update their judgments, beliefs, and evaluations of other individuals, groups, events, and ideas. Recent topics of research in her Implicit Social Cognition Lab include how we can change our memories, how we control our behavior, and how we express prejudice. Derk Pereboom is the Susan Linn Sage Professor of Philosophy and Ethics in the Department of Philosophy at Cornell. As Senior Associate Dean for the Arts and Humanities, he oversees departments and programs in the arts and humanities, the J.S. Knight Institute for Writing in the Disciplines, and the College Scholar Program. Pereboom’s research focuses primarily on free will and the nature of mind. In his books Living without Free Will (Cambridge 2001) and Free Will, Agency, and Meaning in Life (Oxford 2014) Pereboom defends and develops Spinoza’s view that we lack the sort of free will at issue in the traditional debate, but that this does not threaten the most important features of morality and meaning in life, and has the potential to enhance social harmony. In Consciousness and the Prospects of Physicalism (Oxford 2011), he sets out and explores two options for naturalist accounts of consciousness, each inspired by ideas proposed by Kant. Pereboom is deeply committed to graduate and undergraduate education, and he is the recipient of several teaching awards.